This is our new product called the Multi Head it is designed for all 5/8" rigging needs. Lighting, grips and props will all be able to find tons of uses for this great new tool. 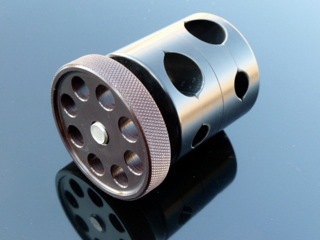 This is CNC machined out of T6061 aluminum, it is hard anodized. Stainless steel bolt and thrust bearing give this item awesome holding power with very little effort. A must for any rigging kit, try it with our 5/8" Rigging rods, they are anodized and 3/8" threaded. $120.00 each but for a limited time order 3 or more and get a discount.